The quest for customers in the mortgage and banking industry has always been competitive. If lenders want to succeed, generating leads and retaining customers are two of the top components every marketing campaign must address. It wasn’t that long ago that banks and mortgage lenders put all their marketing focus on local consumers. Today, they are investing in digital marketing channels that allow them to pinpoint targets and increase shopper convenience across a much wider reach. Regional and national firms now compete with local lenders for the same customers. Marketing plans are evolving too, as it becomes ever more essential to find creative ways to cultivate new customers and retain present clients. Lenders have to think beyond local and turn their focus to being accessible to their customers, building relationships that last a lifetime and foster growth. 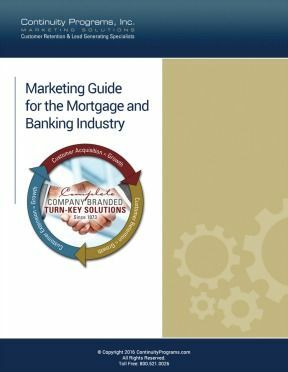 In this Marketing Guide for the Mortgage and Banking Industry, we detail the ways in which customer acquisition, retention, and extension all equal growth for lending organizations. How building your brand slowly and deliberately represents your best chance for reaching potential borrowers. Details on how social media marketing is a vibrant way to attract, engage and retain customers. Important tips on retaining customers through improved customer service, making a great first impression, and offering loyalty benefits and rewards. We also offer valuable insights into current marketing trends, including digital services, as well as how to develop a loyal community. While the role of mortgage lenders remains consistent, clients’ needs have changed. Financial institutions that make the decision to invest in effective marketing today will ensure that they stand out and grab the attention of consumers and set themselves apart from the competition.